In the new state legislative session, lawmakers, have proposed Senate Bill 884 which expands the scope of security guard registration in New Jersey. Looking to Join a Law Enforcement Union? Contact LEOSU Organizing Director Steve Maritas Today! Introduced Pending Technical Review by Legislative Counsel. An Act concerning security officers, designated as “Melvin Santiago’s Law,” and amending and supplementing P.L.2004, c.134. “Owner” or “operator” means an officer, director, member, sole proprietor, partner or associate of a private security company. (3) deterrence, observation, detection or reporting of incidents and activities for the purpose of preventing any unauthorized access, entry or unlawful activity, including but not limited to, robbery, burglary, arson, criminal mischief, vandalism or trespass. The term shall not mean or include, and nothing in this act shall apply to, any law enforcement officer of this State, or any political subdivision of the State, while in the actual performance of his duties. For the purposes of this section, a law enforcement officer shall be deemed to be in the actual performance of his duties if the law enforcement officer is in uniform, or is exhibiting evidence of his authority, is performing public safety functions on behalf of and as assigned by his chief of police or the chief law enforcement officer of his law enforcement agency and is receiving compensation, if any, from his law enforcement agency at the rates or stipends as are established by law. A law enforcement officer shall not be deemed to be in the actual performance of his duties, for the purposes of this section, if the law enforcement officer is performing private security functions or activities for a private employer while receiving compensation for those duties from the private employer, and a law enforcement officer shall not wear his uniform, or otherwise exhibit evidence of his authority as a law enforcement officer, while performing private security functions or activities for a private employer. “Security officer company” means any body, board, person, firm, corporation, partnership, proprietorship, joint venture, fund, authority or similar entity that is organized for the purpose of or primarily engages in the business of furnishing for a fee, hire, reward or compensation one or more security officers. The term shall not mean or include, and nothing in this act shall apply to, any board, body, commission or agency of the United States of America or of this State or any other state, territory or possession of the United States of America, or any county, municipality or school district or any officer or employee solely, exclusively and regularly employed by any of the foregoing. The term shall include any business of watch, guard or patrol agency. “Superintendent” means the Superintendent of the Division of State Police in the Department of Law and Public Safety. “Company maintaining a proprietary or in-house security function” means any body, board, person, firm, corporation, partnership, proprietorship, joint venture, fund, authority or similar entity that is organized for the general purpose of conducting business, but which also employs persons to provide security services exclusively for their business or employees, and does not contract these employees to any other entity or person. “Loss prevention employee” means an unarmed employee of a company and whose primary responsibility is loss prevention and the protection of assets of that business. a. [No] A person shall not be employed as a security officer by a security officer company or a company maintaining a proprietary or in-house security function, or perform the functions and activities of [,] a security officer, unless that person is registered with the superintendent as required in this section. (3) a security employee regulated under federal law. Any person who violates the provisions of this section shall be guilty of a crime of the fourth degree. (4) such further information as the superintendent may require to show the good character, competency and integrity of the applicant. Any person who shall knowingly make a false statement in, or knowingly omit any material information from, an application as required by this subsection shall be guilty of a crime of the fourth degree in addition to any other crime or offense specified by law. No person shall be issued a certificate of registration as a security officer under the provisions of this section if the person has been convicted, as indicated by a criminal history record background check performed pursuant to the provisions of this section, of: a crime of the first, second, third or fourth degree; any offense involving the unlawful use, possession or sale of a controlled dangerous substance as defined in N.J.S.2C:35-2; or any offense where the registration of the individual would be contrary to the public interest, as determined by the superintendent. Each applicant shall submit to the superintendent the applicant’s fingerprints and written consent for a criminal history record background check to be performed. The superintendent shall compare these to fingerprints on file with the State Bureau of Identification in the Division of State Police and the Federal Bureau of Investigation, consistent with applicable State and federal laws, rules and regulations. The applicant shall bear the cost for the criminal history record background check, including all costs of administering and processing the check. A person whose application has been approved by the superintendent shall complete the required education and training program established in section 5 of this act. Upon satisfactory completion of this program, and upon the payment of a fee in an amount established by the superintendent, the applicant shall be entitled to and the superintendent shall issue and deliver to the applicant a security officer certificate of registration. The superintendent may revoke or suspend such certificate of registration for a violation of any of the provisions of this act or for other good cause. A certificate of registration shall be surrendered to the superintendent within 72 hours after its term has expired or after notice in writing to the holder that the certificate of registration has been revoked. The certificate of registration shall be renewed every two years by an applicant for an unarmed security officer position and each year by an applicant for an armed security officer position upon forms prescribed by the superintendent [and payment of] . The applicant shall pay a fee in an amount established by the superintendent by rule and regulation and shall complete an eight-hour refresher course of classroom instruction taught by a certified security officer instructor. The certificate of registration may be renewed without further investigation unless it is deemed by the superintendent that the applicant no longer qualifies or verified objections to the renewal are received by the superintendent prior to issuance. The revocation or suspension of any certificate of registration by the superintendent shall be subject to notice and a hearing. a. In addition to any other penalties prescribed by this act or any other law, an owner or operator of a licensed security officer company or a company maintaining a proprietary or in-house security function who employs a security officer in violation of the provisions of this act shall be liable to a civil penalty not to exceed $10,000 for the first offense and not more than $20,000 for a second or subsequent offense. For the purposes of this subsection, each violation shall constitute a separate offense. (1) In addition to any other penalties prescribed by this act or any other law, a person who permits himself to be employed as or performs the functions and activities of a security officer while in violation of the provisions of this act shall be liable to a civil penalty [not to exceed] of not more than $1,000 for a first offense and not more than $2,500 for a second or subsequent offense. For the purposes of this subsection, each violation shall constitute a separate offense. (2) In addition to any other penalties prescribed by this act or any other law, a certified security officer instructor who fails to comply with rules and regulations governing the functions of a certified security officer instructor shall be liable to a civil penalty of not more than $1,000 for a first offense and not more than $2,500 for a second or subsequent offense. For the purposes of this subsection, each violation shall constitute a separate offense. A penalty imposed under subsection a. or b. of this section shall be recovered in a civil action pursuant to “The Penalty Enforcement Law of 1999,” P.L.1999, c.274 (C.2A:58-10 et seq.). Each owner or operator of a security officer company or company maintaining a proprietary or in-house security function, and each person employed as a security officer on the effective date of this act and any act amendatory or supplementary thereto shall comply with the requirements of this act by the first day of the [seventh] thirteenth month after its effective date or the effective date of any act amendatory or supplementary thereto. Any person employed as a security officer by a company maintaining a proprietary or in-house security function or who performed the functions and activities of a security officer for such a company prior to the effective date of this amendatory and supplementary act shall complete the education and training program established pursuant to section 5 of P.L.2004, c.134 (C.45:19A-5) and register as a security officer with the superintendent pursuant to section 4 of P.L.2004, c.134 (C.45:19A-4) no later than the first day of the thirteenth month following the effective date of this act. (New section) A security officer who carries a firearm in the performance of his duties shall wear a standardized uniform as prescribed by the superintendent in rules and regulations. These rules and regulations shall require SORA Level 2 armed security officers to wear on their uniform a badge indicating this status and armed security officers who wear company-issued shirts to have the word “SECURITY” printed on the reverse side of the shirt. (New section) A security officer, when carrying a firearm in the performance of his duties, shall secure the weapon in a level 3 or higher security holster. This act shall take effect on the first day of the sixth month after enactment. This bill expands the scope of current law regulating security guards in this State. Under the “Security Officer Registration Act,” commonly referred to as SORA, security guards employed by security guard companies are strictly regulated by the Division of State Police. This bill extends SORA’s provisions to security guards employed by private companies. Specifically, under the bill, any person employed as an in-house security officer by a company that maintains a proprietary or in-house security function is required to register with the Superintendent of State Police and complete an education and training course. Under current law, only security officers who are employed by a “security officer company” that furnishes security services to other entities are required to register with the superintendent. Other requirements of SORA also would be extended to in-house security officers under this bill. An in-house security officer would be required to be 18 years of age or older. A person convicted of any of the following crimes or offenses would not be permitted to register as a security officer: (1) a crime of the first, second, third, or fourth degree; (2) an offense involving the unlawful use, possession, or sale of a controlled dangerous substance as defined in N.J.S.2C:35-2; or (3) an offense where the issuance of a license would be contrary to the public interest, as determined by the superintendent. Under current law, a person who acts as a security guard without complying with the registration requirements is guilty of a crime of the fourth degree, which is punishable by a term of imprisonment of up to 18 months, a fine of up to $10,000, or both. The violator also is subject to a civil penalty of $1,000 for a first offense and $2,500 for a second or subsequent offense. The violator’s registration also may be revoked or suspended. Under the bill, these penalties would apply to in-house security officers who violate registration requirements. The provisions of the bill do not apply to loss prevention employees. The bill defines a loss prevention employee as an unarmed employee of a company and whose primary responsibility is loss prevention and the protection of assets of that business. The bill’s provisions also do not apply to employees of a company whose business includes hosting sporting and entertainment events at an arena or stadium where a State, county, or municipal law enforcement agency is on the premises during the event and whose in-house security employees do not carry handguns or other licensed weapons. The bill also does not apply to security employees regulated under federal law. The bill also requires a person employed as an in-house security officer prior to the bill’s effective date is required to register as a security officer and complete the education and training program within one year following the enactment of the bill. The bill also imposes additional requirements on all security officers under SORA. Currently, security officers are required to renew their registration every two years. Regulations promulgated pursuant to SORA require applicants for renewal to also complete an eight-hour refresher course. Under the bill, unarmed security officers would continue to be required to renew their registration every two years, but armed security officers would be required to renew their registrations every year. Both armed and unarmed security officers would be statutorily required to complete the refresher course every year. The bill also imposes additional penalties upon security officer instructors who do not comply with rules and regulations governing the functions of a certified security officer instructor. For a first offense, a person is subject to a civil penalty of not more than $1,000 and for a second or subsequent offense not more than $2,500. The bill further requires all armed security guards in the industry to wear standardized uniforms for identification purposes. The Superintendent of State Police is responsible for determining the standards for this uniform under the bill. 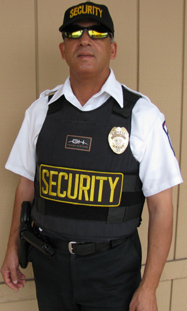 The standards are to require SORA Level 2 armed security officers to wear on their uniform a badge indicating this status and armed security officers who wear company-issued shirts to have the word “SECURITY” printed on the reverse side of the shirt. Finally, the bill requires armed security guards to carry their handguns in a level 3 or higher retention level holster. Handgun holsters are ranked from level 1 to level 4 based on how secure the weapon is in the holster. A weapon in the least secure level 1 holster can be easily withdrawn by the officer or another person. More secure level 2 holsters, which include a “thumb break,” or safety strap retention system, generally are used by police officers. Level 3 and 4 holsters have additional security features. This bill is designated as “Melvin Santiago’s Law” in honor of the 23-year old Jersey City rookie police officer tragically killed by a suspect who grabbed a gun from a Walgreen’s security guard and open-fired on Santiago in his police vehicle as he responded to the armed robbery. SECURITY OFFICER REGISTRATION ACT. (SORA). AN ACT concerning the regulation of … C.45:19A-3 Licensing ofsecurity officer companies; requirements. Click on SORA Updates. 5. … Payment must be made using a debit card or credit card issued by … Officer Registration Act(SORA), must obtain a Security Officer. NJ Guard Training Academy is the LARGEST SORA training private … step and though a credit card is not required, it is HIGHLY recommended. … Must register and possess “30 day Temporary Certificate of Registration as a Security Officer”. 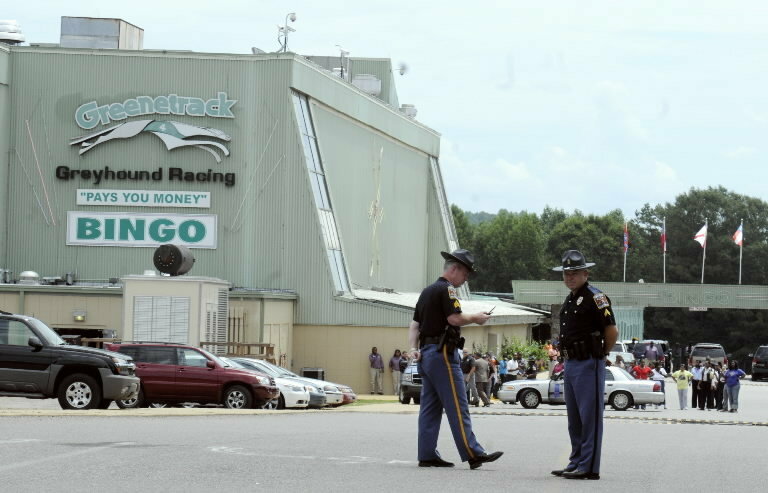 Man shoots self outside Greenetrack casino after pistol-whipping security guard. A Greenetrack security guard was seriously injured Saturday afternoon after being pistol-whipped by his own weapon inside the casino. The suspect in the incident later died of a self-inflicted gunshot wound, Greene County District Attorney Greg Griggers said. A 26-year-old Eutaw man who died from a self-inflicted gunshot wound outside Greenetrack Saturday didn’t have any known problems with the security guard he pistol-whipped, and investigators are still trying to determine what prompted the attack. Tip Tuesday: Can you help Phoenix police find security guard’s killer?